Know the score with the ultimate guide to the world of sport. 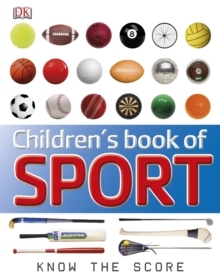 This best-selling reference title for children keeps your eye on the ball through a history of sport and a ticket to the greatest games around. The Children's Book of Sport covers everything from the beautiful game to sports you never knew existed - as well as everything in between. Dynamic photography showcases solo sports, team sports, target sports, racket sports, water sports, combat sports, horse sports, extreme sports, and track and field events. Eye-catching fact boxes highlight key information from sporting rules and regulations, as well as essential tactics and techniques. The world's celebrated sporting stars are profiled, together with a special section on the Olympic and Paralympic Games, from ancient Greece to modern-day competitions. In a league of its own, The Children's Book of Sport is a total masterclass for young sports enthusiasts.